Indiana Jones has to be one of the greatest movie heroes of all time- on one hand, a “nerdy” college professor, but on the other… a swashbuckling, archaeologist adventurer! Of the four Indiana Jones films, the third one is by far my favorite- Indiana Jones and the Last Crusade (after suffering through the 4th film, #3 really should have been his last crusade, but that is another story)…. In this film, not only does Harrison Ford reprise his role as the adventurous professor, but Sean Connery also joins the cast as his less daring, but more studious, father. Han Solo and James Bond in a movie together… what more could you ask for? In this film, the heroes are literally on the quest for the Holy Grail, and the path is predictably treacherous. Not only is the grail hidden in a secret and mysterious location, but the location itself is guarded by a series of lethal traps and obstacles. Many had tried to reach the grail, but none had succeeded… nor had they lived to tell their stories. When Indiana Jones and his father ultimately find the hidden location of the Grail, they learn that there are four deadly challenges standing in the way of their completing the epic quest. And while the Joneses possess as much courage, creativity, and resources as anyone, these are not the assets that ultimately allow them to achieve that which so many previously had failed. No… it was not the “adventurer” persona that primarily saved them, but rather that of the “nerdy professor”. The fundamental reason that no one else had been able to “keep up with the Joneses” was the quality and the quantity of the RESEARCH that they had done. Particularly the elder Jones had studied the grail for years, which gave them the competitive advantage that they needed to acquire the treasure that they sought. Clearly, Indiana Jones needed his courage and creativity to step forward and to attempt to conquer the deadly challenges, but he did not need to step forward blindly. Because of the years of study, driven by his father’s intellect, passion, and thoroughness, Indiana Jones possessed all of the tools he needed to successfully navigate the treacherous obstacles. 1) Knowledge: The thorough understanding of the Grail through years of studying, researching, and experiencing allowed Jones to step knowingly through the first challenge without (literally) losing his head. 2) Data: The accumulation of data, through experimentation and the testing of hypotheses allowed Indiana to successfully take the right path through a complicated maze where one false step would have been fatal. 3) Wisdom: Faced with a seemingly insurmountable chasm, Jones’s wisdom gained from the research allowed him to take the correct “leap of faith” and to cross a boundary that no one else had been able to cross. 4) Insight: To ultimately get the Holy Grail, Indiana Jones had to choose the correct cup from a selection of dozens of choices. The right choice would result in a successful completion of his quest, and the wrong one would lead to an excruciating demise. Jones had no knowledge or data to tell him which cup to choose, but through all of his research he had gained insight into what the answer should be, and this insight allowed him to “Choose wisely” and to successfully complete his quest. Sure… he had his legendary fedora hat, whip, and quick wit, but the true factor which allowed Indiana Jones to succeed was the quality of his research moreso than his courage and agility. Before barreling madly into their “Last Crusade”, the Joneses invested the time, energy, and focus to fully appreciate the challenge in front of them. The R&D role should be very much like the job of Indiana Jones… on the quest for some “magical” object, product, or idea. In today’s highly competitive business world, everyone is on a quest for a “Holy Grail”, and is in a fervent race to find it first. 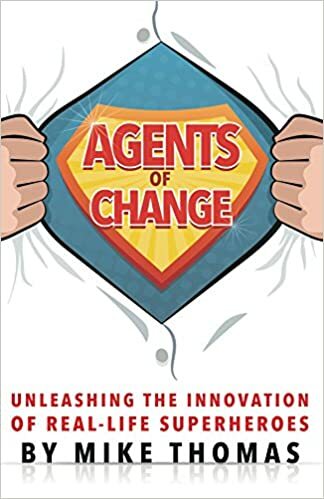 Organizations put their best teams against the challenge, and are investing immense time and energy into rapidly turning an idea into an execution. This quest requires a culture of risk-taking, fearlessness, and urgency, and a team willing to march forward with the aventurer’s spirit. However, in our hurry to start the “development” and to jump headfirst into the adventure, we must not skip the “research” that will ultimately drive success. 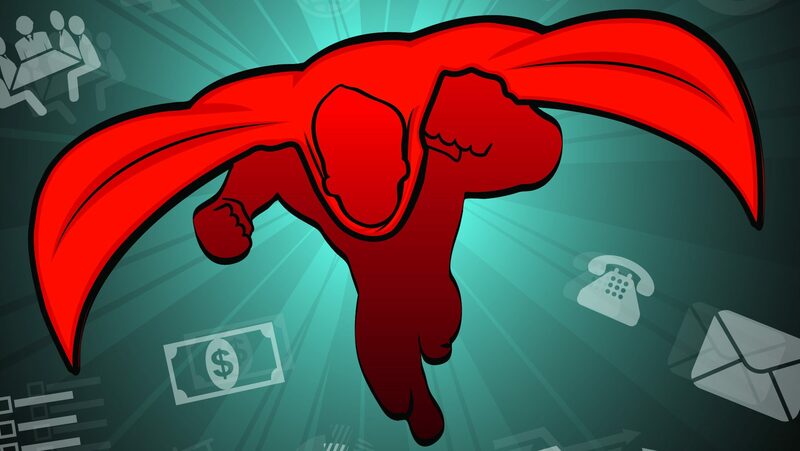 The “need for speed” is often leading even the best teams into pouring all of their energy into the execution of the adventure, rather than on charting the course and acquiring knowledge and insight to guide the design. Essentially, we need to first play the part of the studious and nerdy professor so as to enable the fearless, swashbuckling adventurer. This is not to say that we should would abandon our adventures and bury ourselves in our labs and our textbooks… but rather that we should invest fully in the “R” before running full speed into the “D”. Ideas are easy, Insights are hard. We all have no shortage of ideas… our cubicles are overflowing with clever, interesting, and inspiring ideas that have the potential to win with consumers, to drive the business, and even to change the world. So if that is true, then why aren’t we winning? In our excitement to bring a new idea to life, we often allow impatience or pressure to force us to jumping straight to the execution. We focus on quick solutions that only touch the tip of the iceberg, but do not fully appreciate or realize the depth of the opportunity that lies beneath the surface. Even if we spend time talking with consumers, studying research data, and evaluating trends, our analysis often remains at the surface and does not fully delve into the depths of the concepts and the true motivations of our consumers. Henry Ford’s quote is still my favorite here, “If I had asked consumers what they wanted, they would have said “faster horses””. We all know that our consumers want to “get from point A to point B faster”, but are we working to “make their horses run faster” or are we working on an automobile? Better is boring, Amazing is awesome. None of us want “B’s” on our report cards, and we all want “A’s” to hang on our refrigerators. Yet we often find ourselves settling for programs that are better but boring rather than amazing and awesome. We often fail to allow ourselves the time and research to determine the truly awe-inspiring solution to a problem because we fear the time, money, and resources to bring it to life. So then we instead start with something actionable and try to creatively and agilely transform, through sheer will, this simpler, and executable solution into something that might ultimately win in the minds and hearts of our consumers. It is far harder to take something actionable and make it amazing than than to take something amazing and make it actionable … and we must allow ourselves the discipline to at least define what the “Holy Grail” might be before constraining ourselves with current realities. Don’t just execute with excellence… execute something excellent with excellence. Obviously, executional excellence is critical and we must insure that what we cook up in the labs can accurately, efficiently, and consistently be delivered into the hands of our consumers. We don’t sell ideas, we sell executions… therefore, we must put the rigor and dedication into getting it right. That said, we need to insure that the prioritization of being “on time” and “accurate” does not override the focus on being “insightful”, “delightful”, and a “Wow”. Particularly in Research & Development, while we obviously want to execute our programs, we must first insure that we research and design the “right” programs, and must be vigilant in insuring that before we start executing something with excellence, that that something is excellent itself. Again, the point here is not that we should all tone down our “adventurous” and aggressive approach, and instead bury ourselves in our books and in our labs. It’s quite the contrary in fact. Our R&D and overall Innovation approach should be a fast & furious ride as we engage in the difficult and perilous quest for the “Holy Grail”. However, in the quest for the Grail, we must remember that no matter how much we want it or how hard we work, we must first develop the Knowlede, Data, Wisdom, and Insights to guide us on our quests. There will be many obstacles and pitfalls along the way, as well as the temptation to settle for the easier and faster path. Are we allowing ourselves the true upfront investment in truly researching the path to be taken so as to avoid the treacherous pitfalls before us, or are we impatiently multi-tasking our way into a booby trap that will keep us from ever completing our quest? We have the boldness to take on the adventure, but do we have the patience to do the homework? 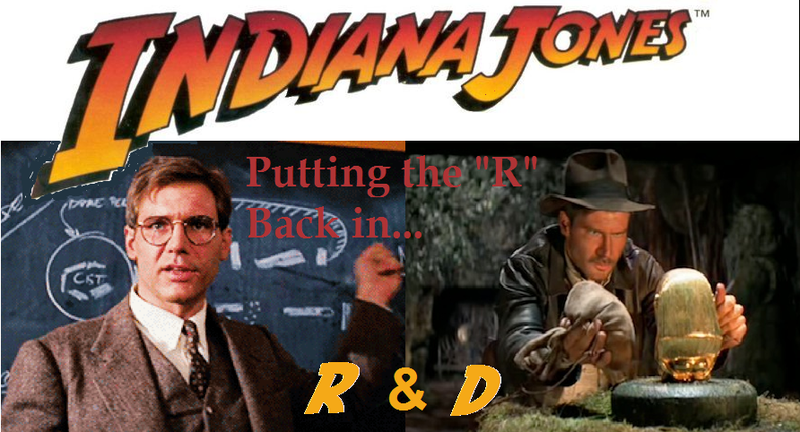 To truly unleash the spirit of Indiana Jones and to find our Holy Grail, we must make sure that we insist on putting the “R” back in R&D. Previous What is your FIELD OF DREAMS? Next Our Career is a RACE… but Why are we RUNNING? MIke very well said. I hope you brought your whip, fedora and quick wit to the office to serve as a reminder of the importance of insightfulness in R&D. Thank you for restoring the sense of adventure in R&D.